This dietitian LOVES snacks at work. Seriously, the snack section of my office is probably my favorite place in the world. Because, inevitably, I become hungry at 3PM and need to take a break from charting. It is so nice to push back from my desk, stretch my legs, and peruse the snack section. While my snack is normally a piece of fruit, sometimes my fellow RDs bring in delicious things that they make at home or bring back from vacation. Chocolate grahams, lollipops, and energy bites have all graced our little corner over the past few weeks. When my co-worker brought in zucchini brownies for all of us to try, I totally fell head over heels with the treat. 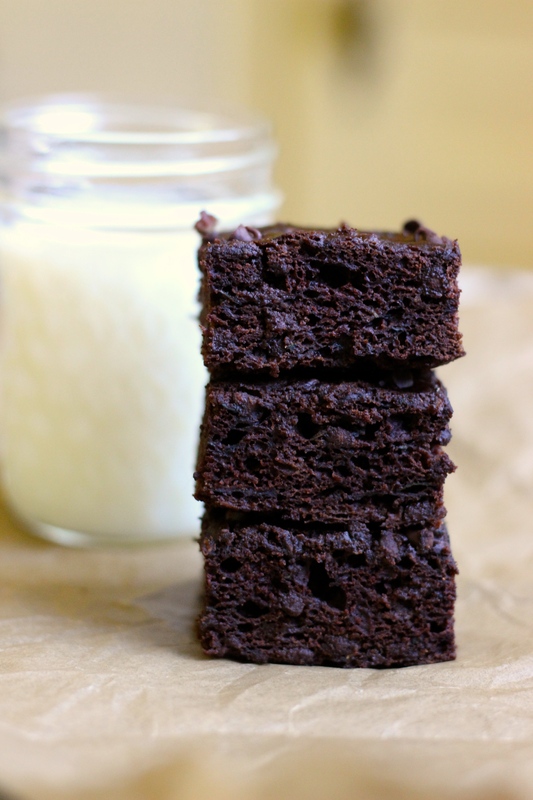 The brownies were delicious and fudgy, but packed with veggie-goodness! 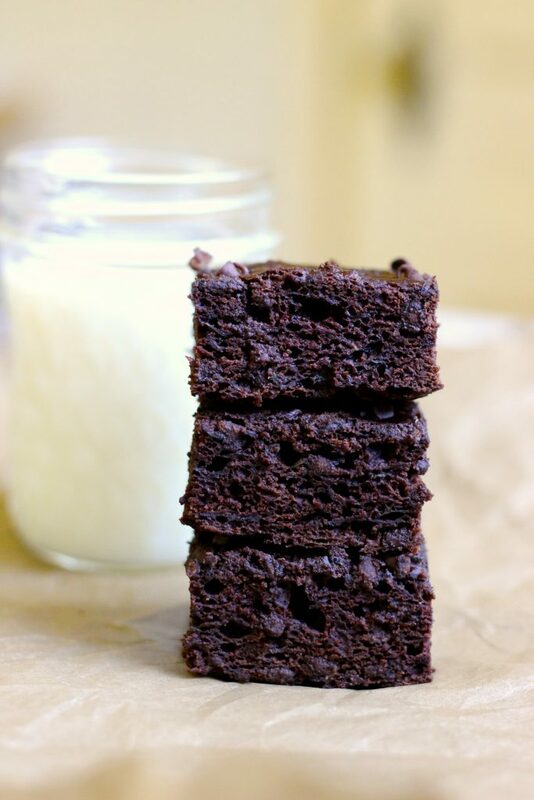 I decided that I had to try to make these Zucchini Brownies myself at home and ended up with a vegan brownie that had all the goodness of the original without any animal products. Plus, this is a great way to use up all that zucchini lying around. 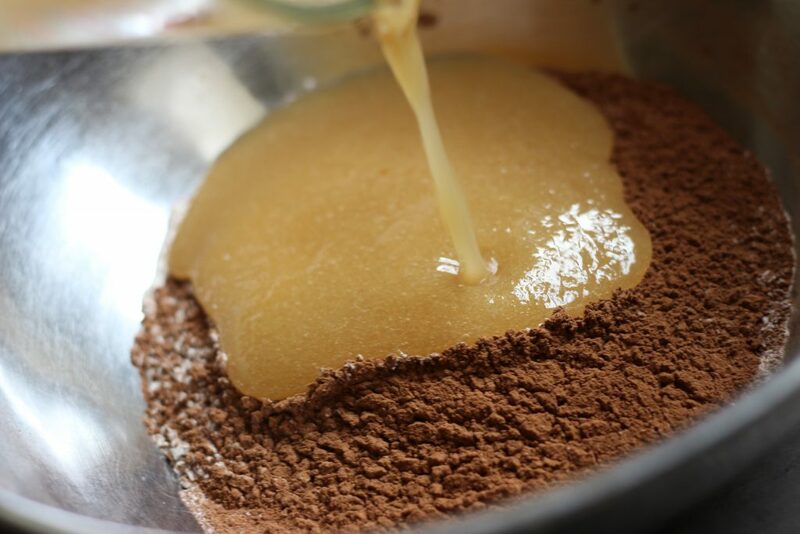 It starts with the dry ingredients – flour + cocoa powder + baking soda + baking powder + instant espresso powder + salt. The espresso powder does not make the brownies taste like coffee, but makes them taste more chocolately!! Whisk the dry ingredients together and then set them aside. Now we pull together the wet ingredients. 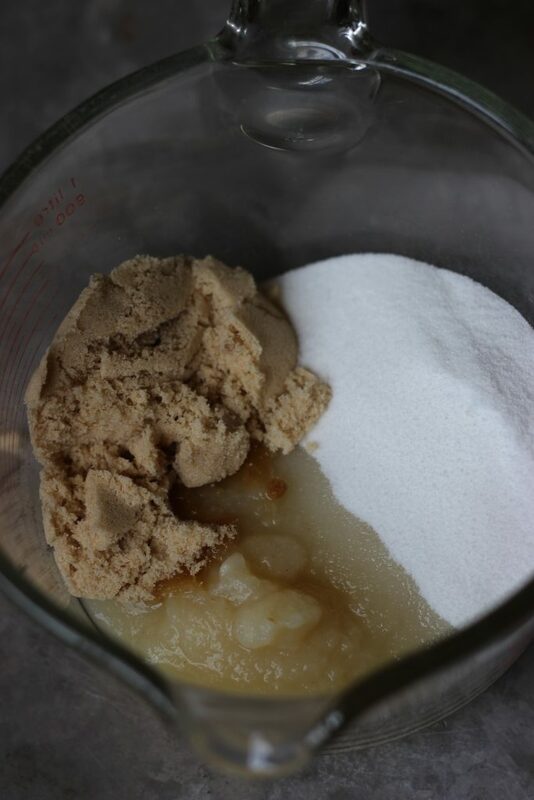 Granulated sugar + brown sugar + unsweetened applesauce + white vinegar + vanilla extract. Whisk to combine. Pour the wet ingredients over the dry ingredients and stir to just combine. THE DOUGH WILL BE VERY DRY! It needs to be dry because of the final ingredient. Toss in some vegan chocolate chips and stir to combine. Pour the batter into a parchment paper-lined 9×9-inch baking pan. Spread the batter out evenly and sprinkle some extra chips on top for garnish. 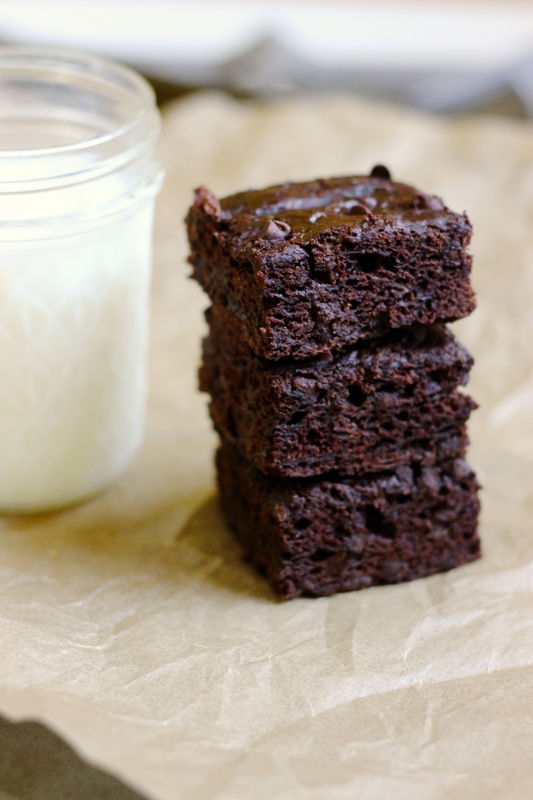 Bake the brownies in a preheated 350 degree oven for 25-30 minutes or until the brownies are set. Cool completely before cutting and serving. 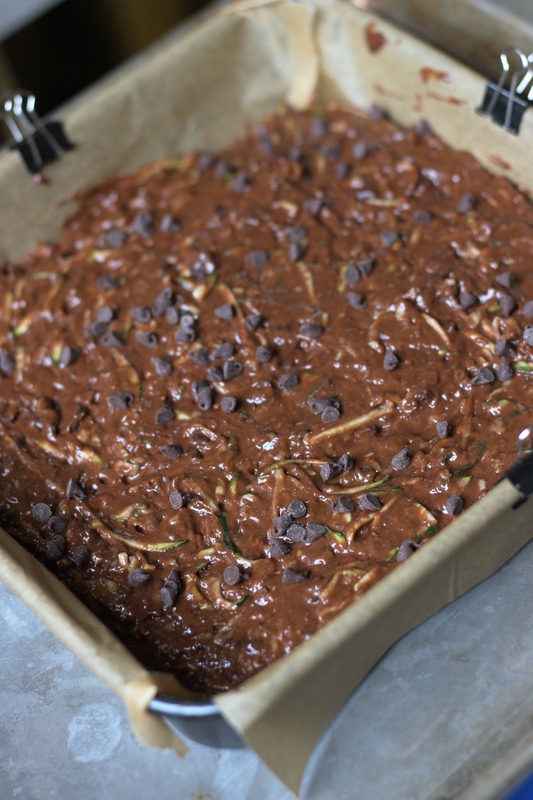 The zucchini all but dissolves into the batter, which means even your veggie-hating loved ones will dig into these brownies. Definitely something to bring to the snack corner this week! Simply A (RD) Fact: Zucchini is a great source of vitamin C, which is important for wound healing! 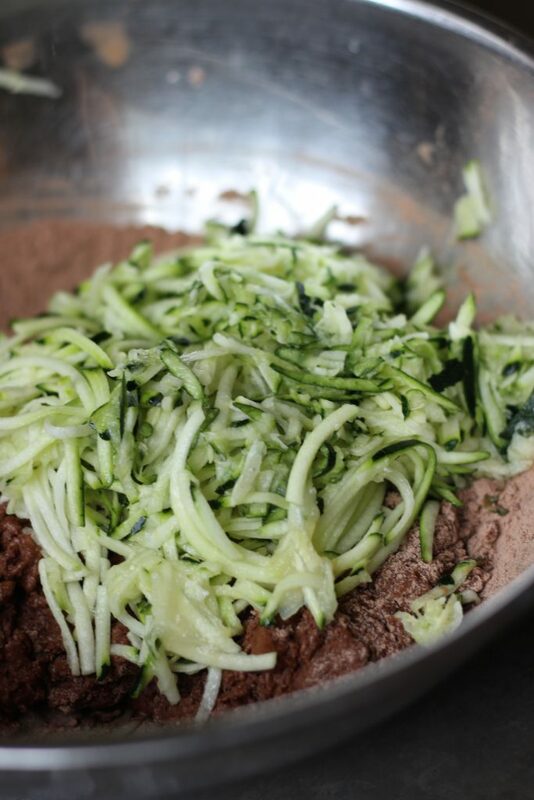 2 cups of shredded zucchini - do not drain/squeeze after grating! In a large bowl, combine flour, cocoa, baking soda, baking powder, espresso powder, and salt. Whisk to combine. Set aside. In a small bowl, combine sugar, brown sugar, applesauce, vinegar, and vanilla. Stir to combine. Pour the wet ingredients over the dry ingredients. Stir to combine - batter will be very dry. Add in the zucchini and stir to combine. 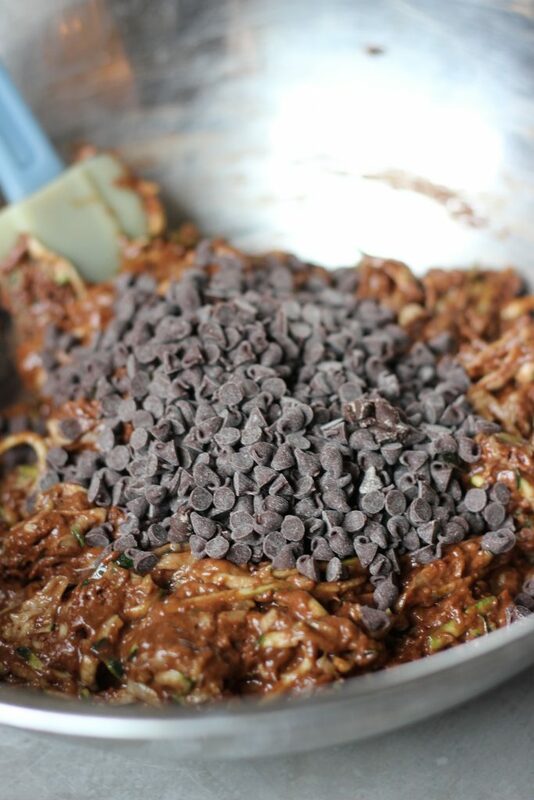 Add in the chocolate chips - stir to combine. Pour the batter into the prepared baking pan. Spread the batter out evenly. Sprinkle the top with additional chocolate chips. Bake the brownies for 25-30 minutes until the brownies are set. Allow the brownies to cool before cutting!